My recent research about this led to studies of past crop formations near Silbury Hill. I had noticed a pattern of circles back in 1988 next to Silbury Hill fit with a misaligned Tree of Life. One of the possible meanings is a small sun rolling out of, or being projected from, a larger sun. I read a theory about this years ago, concerning a formation that looked like a "9" with a small circle at the bottom, similar to a scroll. With the Mandelbrot Set, the projected sun is in the "tip," where I found the Unity Star. With the Mandelbrot Set crop circle formation, the sun was indicated by the eight-foot circle out along the tram line. It was pointed out that there is a correlation between "sun" and son. Later, I purchased a book called, "Jesus Christ, Sun of God." The same type of attributes were associated with various Pagan figures, such as Mithras. This "Sun/Son," in my view, is generally associated with mankind in unity in the future, when we reach the heart chakra level. In the Christian sense, this may be similar to the idea of becoming part of the Body of Christ through communion. This collective Christ/mankind seems to be the "child" of Revelation 12. When the unity is achieved, symbolically the river parts, and the crossover is made. The stopping of the river is a symbolism of stopping time, and viewing the upper levels of the Tree of Life, into the Olam. We will then be able to see the Greater Sun's Light, which is Superluminal, with instantaneous speed. The achievement of this must be done by mankind. It will not be done for us. Certain dreams of late seem to have a road crossing as a similar crossover symbol. And, roads are "man made," perhaps showing symbolically that we must accomplish the rectification ourselves. the bus, the three surrounding, the subways. "Coincidentally," I wrote an e-mail to Michael on 5 July 2005, in which I mentioned the number 484, in reference to the Hundred Acres formation. It turns out that the terrorist attacks in London on 7 July 2005 happened 484 (inclusive) days after the attacks in Madrid on 3-11-2004. After the Madrid attacks it was reported that the days between (non-inclusive) those attacks and the 11 September 2001 attacks came to a "coincidental" 911 days. The Mega Glyph crop circle formation seemed to be related via the 409 circles (360 + 49). It had 13 large circles in each of the six arms, for a total of 78, like the Tarot deck. Check this against the G8 Conference, as G=7 in English alphanumerics. The Mega Glyph had 55 small circles in each arm. See the 48400 = 176 x (5 x 55) calculation below. This may all be just coincidences, but I wouldn't be too sure. My e-mail to Michael is pasted below. Note the 444 connection in the Hundred Acres formation. Interestingly, 176 is a related ancient number, as it is one-tenth of a mile in yards, and one of those "11" type numbers. 4 x 44 = 176, or 11 x 16. The "birth" year of the USA is 888 x 2 = 1776, or 4 x 444. The numbers on the right are "A" notes in cps of the musical scale. I think that this formation at Silbury Hill is another 11:11 message. 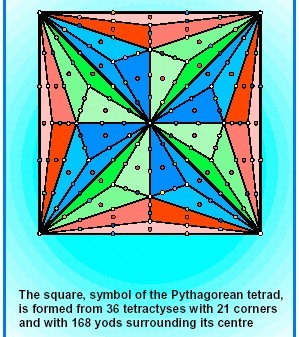 There are 11 rays on each side of the fish/eye portion, composed of 5 rays of standing crop and 6 rays of laid down crop. The rectangular parts near the fish's mouth, may suggest the colon [:] between the elevens. This is often referred to as the "third eye," indicating spiritual vision. The ancient Egyptian masks, such as that of King Tut, have a serpent's head protruding from the same area of the forehead. It is said that this represents the arising of the Kundalini. The son of the Egyptian trinity, Horus, is known for his "eye" symbolism, and for the dawning sun of a New Age. Seeing the new formation as a "spider" is an astute observation, in my opinion. 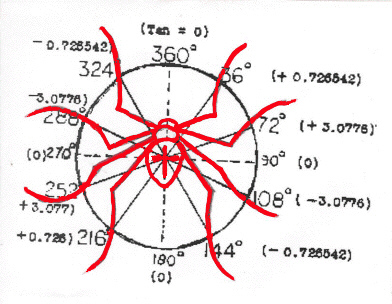 Although this one does not have the "required" eight legs, I feel that there may be a connection. Please do no let my "Bogarting" of this forum stop you from posting your own ideas. I am editing my July posting on 16 August 2005, by adding this lower portion to show the Aztec formation that appeared around 9 August 2005 at Wayland's Smithy, near Ashbury, Oxfordshire. Compare it with the Gematrian Wheel above. The sunburst had 18 x 18 = 36 rays. This is the base "Gematrian numer" on the "Wheel." wave is generated from wires crossing magnetic fields . . .
movements in the lower latitudes? . . . As the earth spins inside it's magnetosphere 'motor'?? Silbury Hill is included in the "Code" work of Carl Munck, along with some 200 other ancient sites. His analysis of Silbury Hill is based on two circles, the base perimeter and the the circular area at the top of the hill. The related formations often seem to incorporate two major circles. The pit was full of people..men, women & children. They were all facing the screen, intently intrigued by the pictures & story. Many of them were laying on their stomachs to watch. Some of the children were busily playing in the rocks & puddles of water in the bottom. No one looked around or up. I could see all around & down..observing, but not involving in the movie. As i watched, SUDDENLY THE MOVIE SCREEN WENT BLANK (in the middle of the movie). Simultaneously to this event, I saw a HUGE BLACK HOLE OPEN in the side of the pit. A big rush of WATER was beginning to pour into the pit. I was transfixed..as I saw there was NO EXITS in the pit. The people sat up startled when the movie quit. They were mulling around in confusion & running through little streams & puddles on the floor. They tried to gather the children & still NO ONE PAID ATTENTION to the HUGE WATERFALL coming at them, until it was too late. Many drowned in the pit. A FEW good SWIMMERS FLOATED to the TOP RIM ..going WITH THE FLOW.. It seems that it may be important to learn how to swim the waters of the unconscious! Dee and I have recorded many dreams about fish, water, swimming, and the like. We think some of them may be about the change of the Ages, from Pisces, the Fish, to Aquarius, the "Water Bearer." Instead of having one Tree which connects the three realms of the Eternals, the Living and the Dead, what we now have is two Trees. One of these, the Tree of Life, has become unapproachable by the Living, who are kept away by the Flaming Sword. The other, the Tree of Good and Evil, is unapproachable by the Dead, because they have become entangled with the demonic Qlippot of the Other Side. This entanglement is portrayed allegorically in the Book of Genesis by the kidnapping of Joseph by his envious brothers. Envy is the hallmark of the Satanic ego-persona, in which the Self is diminished to the status of a passive Object. In order to establish its tyranny, the ego must send the Subjective elements of the Self into Exile. Thus, the dreamer Joseph is sold into exile in Egypt, a place regarded by the Jews as the domain of demons. In Hebrew the name for Egypt - Mizraim - is the dual plural of mezurah, which denotes a walled-in area, like a fortress surrounded by ramparts. This reflects the condition of the divided Selfhood of Man, with its Subjective and Objective poles sealed off from one another. Joseph�s �coat of many colors� represents the �garments of Light� which Adam and Eve wore in the Garden of Eden. The intricate fractal pattern of this garment endows its wearer with the perception of an Infinite Reality, created from moment-to-moment by the power of the Imagination. While Light consists of the full spectrum of a myriad hues, however, the shrunken �objective� eye of the ego-self crudely mixes them all together to make white  the whiteness of a corpse drained of Life. When Adam and Eve were expelled from Eden, therefore, they were stripped of their parti-colored robes of Light and given coarse white garments. According to the Oral Tradition, the coarse cloth was a mixed weave of flax and wool that�s called sha�atnez in Hebrew. Since the consonants of sha�atnez also spell the words satan-�az, meaning �insolent Satan�, the Kabbalists call this flax-wool weave �serpent�s skin� and view it as a symbol the demonic entanglement into which a portion of the collective human Soul Neshamah has fallen. "Be astonished, O ye heavens, at this, and be horribly afraid, be ye very desolate, saith the Lord." For my people have committed two evils; they have forsaken me, the fountain of living waters, and hewed them out cisterns, broken cisterns, that can hold no water." The track we must follow to accomplish this Tikkun of the Torah is the pathless path of the Leviathan. We need to submerge ourselves like the Fish in the �lower waters� so that we can discern the fractal pattern which reveals the Symmetry of the �higher waters�. In doing so, let us follow the steps of the consummate Tzaddik, Joseph the Dreamer, through the 50 gates of the Unconscious. Our next voyage, in Chapter Six, will take us in the ship of our Imagination from the shoals of mundane Time to the Sea of Jubilee. These are also the colors associated with the seven chakras, in the order of chakra one through chakra seven, from left to right. "Green = 49" is the fourth-Heart chakra. This is figured as A=1, B=2, etc. 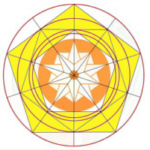 The fourth chakra, related to 49 Green, is represented in the center of the Tree of Life, by Tipheret, the sixth sphere. In terms of the twelve sons of Jacob, from which the Tribes derive, the sixth sphere of the Tree is associated with the eleventh son, Joseph, with his Coat of Many Colors. The New Earth & "The Whole City is a Temple"
My Post: Number Codes in Pi (The Movie) -Amazing! We thank the crop circle photographers and urge support for them. Part of this article was originally uploaded on June 26, 2005 and was included in a longer article. The article was separated into parts, starting 31 July 2005. Part Four originally uploaded on August 20, 2005. This article was last updated on August 29, 2005.